Benefits offered at Chicago-area technology companies that are seeking employees who can make a big impact focus on well-being and financial wellness, along with traditional medical and dental benefits. FourKites has an on-site gym and health and wellness advisers, HealthJoy has flexible paid time off and parental leave, and ActiveCampaign has a family planning assistance program. Benefits experts say companies are helping workers save for retirement by automatically enrolling new employees in 401(k) plans. Keith Mason of Newell Brands said company data show few workers opt out of the program and employees thought it showed the company cared about them. Researchers recruited more than 6,500 people, ages 70 and older, and found that those who were most physically fit had a more than twofold increased likelihood of being alive after 10 years than those who were the least physically fit. The findings, to be presented at the American College of Cardiology's annual meeting, also showed that the number of heart disease risk factors didn't impact the risk of death. Indira Talwani, a US district judge in Boston, said the FDA has until March 2020 to issue a rule that will require graphic health warnings on packs and in advertising of cigarettes. The judge rejected the agency's proposal to complete the long-delayed final ruling by March 2021, saying the FDA missed a deadline that would have completed the rule by 2015. CDC researchers found that children from households with annual incomes below $35,000 or who lived below the federal poverty level had a higher risk of developing gastrointestinal and respiratory illnesses, but they had reduced odds of missing school, compared with those from higher-income households. The findings in the agency's Morbidity and Mortality Weekly Report, based on 2010 to 2016 survey data involving youths ages 5 to 17, also showed that among those who did miss school, children from low-income families had longer absences than children from higher-income households. Research published in the journal Neurology associated following certain heart-healthy diets in early adulthood with better cognitive function at middle age. The study did not find a link between the Dietary Approaches to Stop Hypertension, or DASH, diet and cognitive changes, but people who had higher adherence to a Mediterranean diet or the A Priori Diet Quality Score plan showed a lower rate of decline in cognitive and executive function at middle-age than those with low adherence. Price shopping could help consumers save as much as $5,400 annually on asthma inhalers and $102 on hypertension drugs, according to a study conducted by the US Public Interest Research Group. Researchers surveyed over 250 pharmacies in 11 states to determine the prices of 12 drugs for asthma, hypertension and diabetes, and they found that eight of those medicines were 8% to 840% cheaper at smaller, independent pharmacies compared with prices at large pharmacy chains. Postmenopausal women who took oral hormone therapy for at least 10 years beginning before age 60 were 9% to 17% more likely to develop Alzheimer's disease, compared with those who didn't receive oral hormone therapy, but no increased Alzheimer's risk was found among women who received vaginal hormone therapy, Finnish researchers reported in The BMJ. However, the findings shouldn't cause worry, and short-term hormone therapy had more benefits than risk for women going through early menopause, said Dr. JoAnn Manson, who co-wrote an accompanying editorial. School district and community leaders in six Texas counties are working with the Texas Hunger Initiative at Baylor University on how school meals, such as breakfast programs, can help address food insecurity in areas near the Mexico border. The McAllen Independent School District's breakfast program, which has a 108% participation rate, may serve as a model. Breakthroughs. Connections. Leadership. Decisions. Change. Institute & Expo brings together the best minds in health care and beyond together to focus on making health care better. It's all there. Make sure you are, too. Register before March 18 and take advantage of Super Saver registration rates. PPO Direct Members offer payers and administrators targeted strategies that can help expand their provider networks while better serving their customers. Providence Preferred, a member of PPO Direct, is a Portland-based preferred provider organization composed of physicians, hospitals and ancillary service providers in Oregon and southwest Washington. Providence Preferred is designed to manage the cost, delivery and quality of health care for its diverse clientele. This online course gives you a solid foundation in Medicaid's fundamentals including funding and administration, eligibility, long-term services, managed care, waivers, regulatory issues, and more. It's professional education that gets noticed and grows careers. Learn more about Medicaid Primer and enroll today. 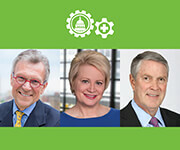 During AHIP's National Health Policy Conference (March 13 and 14 in Washington, D.C.), Senator Tom Daschle, Susan Dentzer, and Senator Bill Frist will discuss a roadmap for reimagining health care. See all the speakers and topics. Register today for #AHIPPolicy.